There are over 80 species of Magnolia trees, and some are native to the United States, according to the National Arboretum. These flowering trees are highly desirable by home gardeners and landscapers for their large, showy blooms and relatively low-care needs. Some species are evergreen, including the popular Southern Magnolia (M. grandiflora). Regardless of species, magnolia trees all have the same basic care requirements, including acidic soil. The climate preferences of magnolia trees vary by species, but in general, most thrive in temperate areas that do not have prolonged below-freezing winter temperatures or very hot summers. These areas are covered by USDA growing zones 7 through 10A. The Star magnolia (Magnolia stellata) is one of the cold-hardiest magnolias and will grow in USDA zone 4, according to the University of Utah. 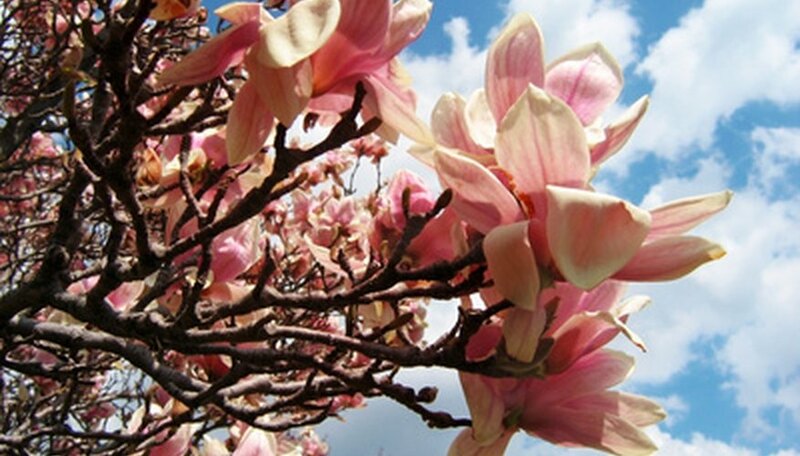 Magnolias grow best in acidic soil, which is soil that has a pH level of 6.0 or below. Test the soil with a pH kit available at home or garden centers. If the soil is not acidic enough, amend it with ammonium sulfate or peat moss. In fact, magnolia trees thrive in moist, peaty soil, according to the University of Florida. Work the materials at least 1 foot into the soil, in an area that extends to the tree's canopy. Magnolia trees grow in full sunlight or in locations that receive part sun and part shade. Magnolia trees will not grow or bloom well in full shade. These hardy trees can tolerate both drought conditions and extended flooding, but grow best when the soil is kept consistently moist. Most magnolia plants need to be pruned. Many have branches that will droop the ground if not trimmed, while others grow on multiple trunks and need to be trained to one leader trunk. This can be achieved by removing any vertically growing branches that are next to the trunk. The bark and wood are fairly weak, so broken or damaged branches should be removed before they fall. Magnolia trees are known for their pest and disease resistance. They do, however, suffer from girdling. These trees have large, shallow roots that can stretch up to four times the width of the tree's canopy. The roots may double back and wrap themselves around the trunk, cutting off the supply of nutrients to the tree. Monitor for these roots and remove them if you see them, or the tree will die from the canopy down.